Needless to say, after not wearing a costume the first year, we have worn one ever since! The next two years, we ended up just buying pre made, unoriginal costumes for the most part. But last year, we decided it will be fun to have a family costume. I don't think we'll ever go back! 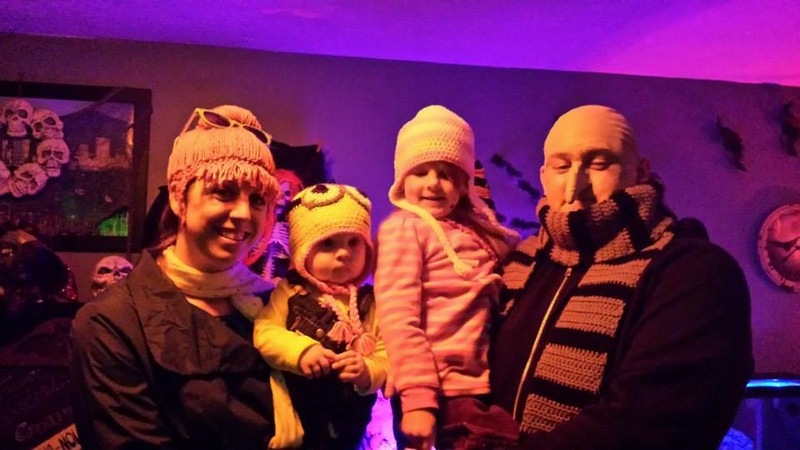 Last year we went as "Despicable me" This was the start of trying to create our own costumes. There were not many pre made costumes out there that fit what we needed so we had to be creative. We found this sites that has costume sets already put together. While interesting, it was also pretty pricey. We ended up just finding what we needed online and at Goodwill! The finishing touches on these costumes were the crocheted hats/items I made for everyone. I made hats for my two girls, a wig for myself, and a scarf and dickie for my husband. It was a hit!!! This year we mixed our favorite holiday with the costume! 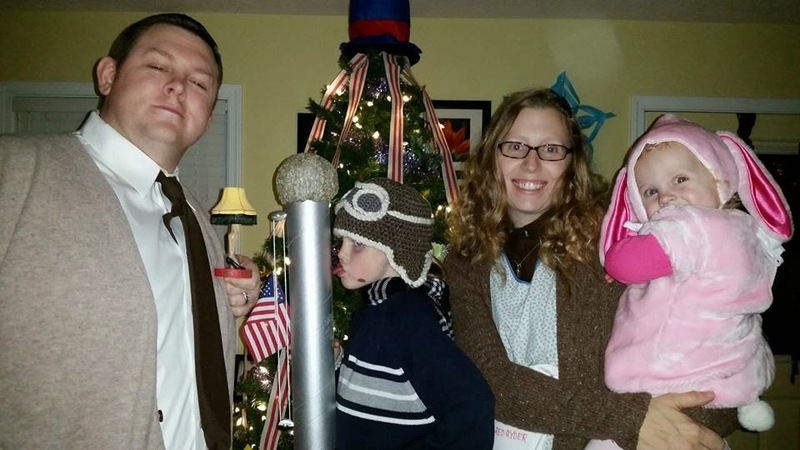 We did "A Christmas Story" for our family costume. It was fun trying to figure out what everyone would be. Sometimes it's hard to make a costume that people will be able to figure out, when the costumes are just every day people, even if it's from the 40's. The trick is to find those little things that will absolutely give it away! My husband was the dad in the story. He wears just a white button down with a mustard cardigan and slacks. That could be any ol Joe on the street though right? SO, he did a few things to make his costume stand out. He found an older pair of pants of his, and cut the bottom of it. He then used velcro and added a stuffed dog to his leg so that it signified the part of the movie where the dogs were tearing up his pants. He also bought a small bobble head of the leg lamp. He carried that around saying "It's my major award!" 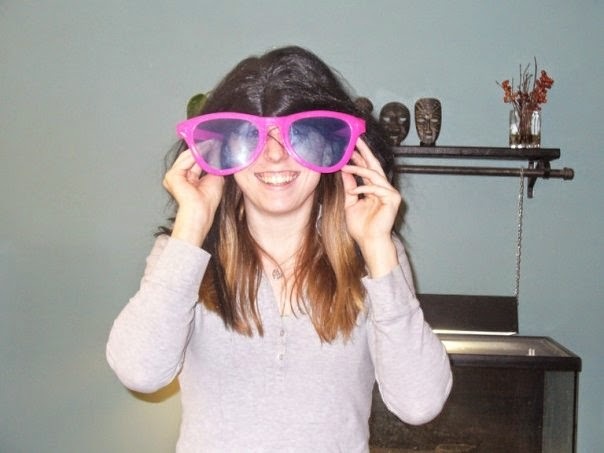 My youngest daughter was easy. She's only two so we found a bunny costume and she was "the pink nightmare." If she was by herself, most would just think she's a bunny, but when she was with the family it was obvious what her costume was. At first we were going to have my oldest daughter be a bunny too. She did not like that though, thinking it was too babyish. Being a boy though, was okay for her. Go figure! LOL. So we dressed her up as Flick from the movie. We got her a boy sweater and scarf at Goodwill, and I crocheted her an aviator hat. My husband created a flag pole for her to carry around, that she would periodically pretend to stick her tongue to! I was the Mom of the family, of course. I had to find an older looking dress, one that buttoned up to my neck, an old fashion apron and a sweater. All would have been hard enough as it is, but to make it harder, I'm pregnant! Thankfully I found it all at Goodwill, Once Upon a Child, and Ebay! Just the outfit wasn't enough to make my costume obvious though. I bought a newborn onsie, and wrote on it "This boy wants a Red Ryder carbine action two-hundred shot range model air rifle", and attached it to my belly. I put curlers in my hair the night before, took them out before the party, messed them up a little to give it the frazzled look, and I was done. We had a great time and most everybody could tell what movie we were from. I do wish that I was able to crochet more pieces for each of us though. There's always next year!